Growing Up . 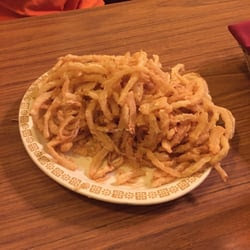 . .
while onion rings were like 25 cents! Served with "sauces" on the side to dip your rings in! Not a lot of rings and certainly not enough to feed a family . . .
that we're too full for our dinner! 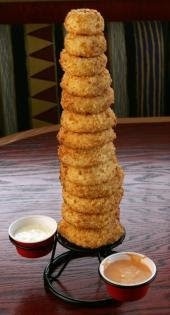 without ordering an onion ring appetizer! It's just what you do! They were good. I liked the addition of cornmeal. It gave them a nice crunch. 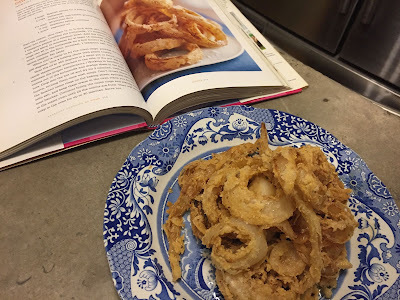 dip in the flour/cornmeal mixture and fry in small batches. we'll just head south to Jim's Steak House!